The management can be divided into the active bleeding episode, the prevention of rebleeding and prophylactic measures to prevent the first haemorrhage. 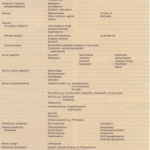 Despite all the therapeutic techniques available, the prognosis depends on the severity of the underlying liver disease. Initial management of acute variceal bleeding See also general management of gastrointestinal haem orrhage. 1 Assess the general condition of the patient-pulse and blood pressure. 2 Insert an intravenous line and obtain blood for grouping and crossmatching, haemoglobin, PT, urea, electrolytes and liver biochemistry. 3 Restore blood volume with plasma expanders or blood transfusion if possible. 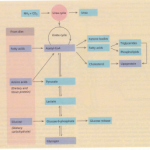 These measures are discussed in more detail in the treatment of shock. Prompt correction of hypo volaemi a is necessary in patients with cirrhosis as their baroreceptor reflexes are diminished. URGENT ENDOSCOPY should be performed to confirm the diagnosis of varices and to exclude bleeding from other sites (e.g. 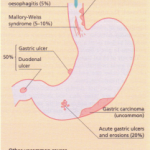 gastric ulceration), which are sometimes the source of haemorrhage in these patients. Portal hypertensive (or congestive) gastropathy is the term used for chronic gastric congestion, punctate erythema and gastric erosions and is a source of bleeding. Varices mayor may not be present. Propranolol is the best treatment for this. IN1ECTION SCLEROTHERAPY OR VARICEAL BANDING. The varices should be injected with a sclerosing agent that may arrest bleeding by producing vessel thrombosis. A needle is passed down the biopsy channel of the endoscope and a sclerosing agent is injected into the varices. Alternatively, the varices can be banded by mounting a band on the tip of the endoscope, sucking the varix just into the end of the scope and dislodging the band over the varix using a tripwire mechanism. Acute variceal sclerotherapy and banding are the treatment of choice; this arrests bleeding in 80% of cases and reduces early rebleeding; 15-20% of bleeding comes from gastric varices and here results of sclerotherapy are poor. Other measures available VASOCONSTRICTOR THERAPY. The main use of this is for emergency control of bleeding either whilst waiting for endoscopy and sclerotherapy or if the latter has failed to control the bleeding. The aim of vasoconstrictor agents is to restrict portal inflow by splanchnic arterial constriction. • Octreotide (a somatostatin analogue-50 f.Lgbolus followed by an infusion of 50 f.Lghour-I for 48 hours) will produce splanchnic vasoconstriction without significant systemic vascular effect or complications. Trials are still in progress but it is safe, as effective as balloon tamponade and comparable to sclerotherapy and should now be used as first-time treatment whilst awaiting sclerotherapy. • Vasopressin. An infusion of 25 units hour:’ should be administered by a central venous catheter (if possible) to avoid the risks of local leakage and necrosis. Vasopressin should not be given to patients with ischaemic heart disease. The addition of nitrates either by the intravenous, sublingual or patch route has been shown to enhance the efficacy of vasopressin and to reduce its complications. The patient will complain of abdominal colic, will defaecate and have facial pallor due to the generalized vasoconstriction. Glypressin (2 mg bolus 6- hourly) is longer acting than vasopressin and is an alternative. BALLOON TAMPONADE is used mainly to control bleeding if sclerotherapy has failed or is unavailable or if vasoconstrictor therapy has failed or is contraindicated. The tube should be left in place for up to 12 hours and removed in the endoscopy room prior to sclerotherapy. The usual tube is a Sengstaken-Blakemore. The tube is passed into the stomach and the gastric balloon is inflated with air and pulled back. It should be positioned in close apposition to the gastro-oesophageal junction to prevent the cephalad variceal blood flow to the bleeding point. The oesophageal balloon should only be inflated if bleeding is not controlled by the gastric balloon alone. This technique is successful in up to 90% of patients and is very useful in the first few hours of haemorrhaging. However it has serious complications such as aspiration pneumonia, oesophageal rupture and mucosal ulceration, which produce a 5% mortality. The procedure is very unpleasant for the patient. REPEAT SCLEROTHERAPY once to control recurrent bleeding. Further sclerotherpy is not advisable if bleeding continues and other measures should be pursued. 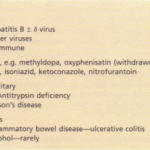 MEASURES TO PREVENT ENCEPHALOPATHY. Portosystemic encephalopathy (PSE) can be precipitated by a large bleed (since blood contains protein). The management is described below. NURSING. Patients require high-dependency/intensivecare nursing. They should have nil by mouth until bleeding has stopped. The source of bleeding should be re-established by endoscopy. It is sometimes due to an ulcer produced by previous sclerotherapy and this is difficult to manage. REPEAT SCLEROTHERAPY for varices . OCTREOTIDE INFUSION for 3-5 days. SHUNT (TIPS). This method can be used to reduce the portal venous pressure and is performed with a local anaesthetic. A guide wire is passed from the jugular vein into the liver and an expandable metal shunt is forced into the liver substance to form a channel between the systemic and portal venous systems. This method is used in cases where the bleeding cannot be stopped. EMERGENCY SURGERY is used when sclerotherapy fails or if TIPS is not available, particularly if the bleeding is from gastric fundal varices. Oesophageal transection and ligation of the feeding vessels to the bleeding varices is the most common surgical technique. Acute portosystemic shunt surgery is infrequently performed in the UK. Prevention of recurrent variceal bleeding Following an episode of variceal bleeding, the risk of recurrence is 60-80% over a 2-year period with an approximate mortality of 20% per episode; these facts justify the use of measures to prevent such rebleeding. The use of repeated courses of injection sclerotherapy or banding at weekly intervals leads to the obliteration of the varices by fibrous tissue. This is now the method of choice. Follow-up endoscopy with treatment should be performed at intervals to keep varices ablated. Results show a reduction in bleeding episodes but the effect on survival is controversial and probably small. Complications include oesophageal ulceration and mediastinitis and strictures occur in about 10% with repeated sclerotherapy. Banding has fewer complications, particularly in stricture formation. f3-ADRENORECEPTOR BLOCKADE. Oral propranolol in a dose sufficient to reduce resting pulse rate by 25% has been shown to decrease portal pressure. Portal inflow is reduced by two mechanisms: a decrease in cardiac output (f3I) and also by the blockade of f32vasodilator fibres on the splanchnic arteries, leaving an unopposed vasoconstrictor effect. This has been shown to decrease the frequency of rebleeding in patients with well-compensated liver disease and some studies show it to be as effective as sclerotherapy. SURGICAL PROCEDURES. Portosystemic shunting is associated with an extremely low risk of rebleeding but the diversion of portal blood away from the liver produces significant encephalopathy. Operative mortality is low in patients with Child’s Grade A (0-5%) but encephalopathy still occurs. Child’s Grade C has a very poor prognosis. The ‘shunts’ performed today are usually an endto- side portocaval anastomosis or a selective distal splenorenal shunt (Warren shunt), which maintains hepatic blood flow via the superior mesenteric vein. Oesophageal transection does not produce encephalopathy but rebleeding eventually occurs. 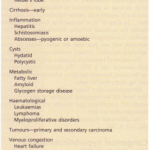 Liver transplantation should always be considered. Patients with cirrhosis and varices should be prescribed non- selective f3-blockers; this reduces variceal haemorrhage and may increase survival.